Meet the rally-spec Bajaj Dominar: Desert Storm ready! If you don’t already know about it, The Desert Sport is the longest and among the toughest rally championships in India. It has different categories for 4×4 vehicles, cars and bikes and all the vehicles participating in the Desert Storm rally are specially prepared for the event. Talking about the Moto section, it sees a large number of participants and teams in their specially prepped bikes. The battle for the crown takes them through about 2,000 km in a span of seven days. 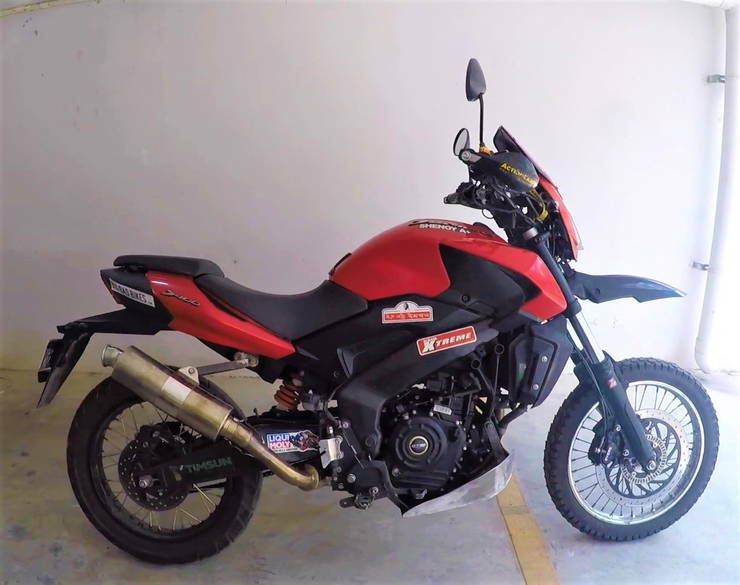 The video below by MotoSlug shows a Bajaj Dominar that has been specially prepared for the Desert Storm Rally championship. Let’s take a look at the video before discussing more about the bike. 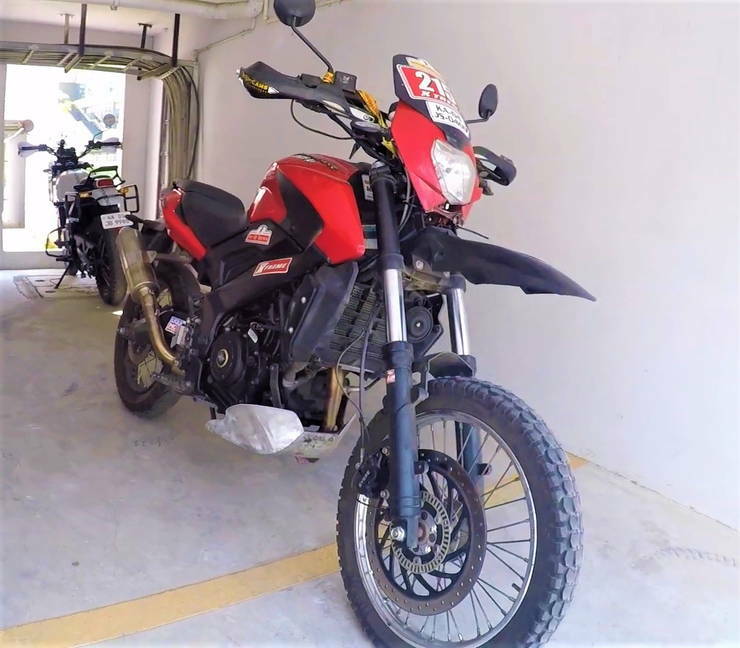 As seen in the video, this red black Bajaj Dominar is a far cry from the stock motorcycle. It has got a ton of modifications done on it so as to make it durable enough to withstand the hostile conditions of the Desert Storm rally. There are many other modifications which the owner plans to do at a later stage, about which we will talk after discussing the mods that have been done already. The first and foremost change the Dominar needed to qualify as a rally spec bike was new wheels. It now runs on spoked rims, 18-inch unit up front and a 17-inch unit at the rear. The rims are shod on to off-road spec tires which lend the bike extra grip during the rally. The front fender has been replaced with a long snout and the front fairing has been changed too. The handlebars are custom units which have been placed according to the rider’s preference. Same is the case with the footpegs, which are custom spiked units (spiked for grip) and are placed in such a way so as to make the riding triangle much more easier for the rider. Knuckle guards have been added for protection. Talking about other structural changes on the bike, the front and rear suspension have been reworked. While the front forks have their springs changed and ride height along with spring nature altered, the rear gets a completely new monoshock unit. They have been tuned as per the riders need and behave according to his weight. The bike has been fitted with a huge aluminium bash plate while a fork raiser has been placed too. Talking about the exhaust, its a steel unit with muffler and is not a completely full free flow unit. It does sound quite throaty though when the bike is revved at the end of the video. The engine oil has been changed to Maxima 10W-60 oil, which provides better performance. Coming to the modifications that will be made on the bike in the future, the bike will be fitted with auxiliary light along with a semi engine cover to protect it from damage during falls at the rally. The tank will also be changed but that will be done after the rally, as will be the exhaust. before the event, the owner plans to install a 50 mm sprocket which will give the bike a better low-end response. A new coolant fluid along with better brake pads are also lined up. The stock Bajaj Dominar (pre-facelift version) was powered by the KTM Duke 390-derived 373cc, four-stroke single cylinder engine. The engine pumped out a good 35 Bhp of power along with 35 Nm of torque. A 6-speed manual gearbox with a slipper clutch were standard fitment on the bike. The newer version of the bike makes more and the peak torque arrives earlier in the rev range along with several other enhancements it comes with. However, this Rally spec Dominar is a completely different animal and we wish the owner best of luck for the upcoming championship.